PRODUCT SUGGESTION: We now carry Imox (generic Raptor) in quarts and gallons. Imox is a grass and broadleaf herbicide with superior broadleaf control and has some residual effect as well. Cost is less per acre than Clethodim and Butyrac 200 and can be applied in one application instead of the normal two. Overall Imox is the best choice for grass and broadleaf control in clover, alfalfa and chickory. Broadleaf Herbicide that controls weeds in soybeans, peanuts, seedling and established alfalfa, and seedling birdsfoot trefoil. Post-emergent broadleaf weed control in Alfalfa, and select forage legumes in the Deer Food Plot family. 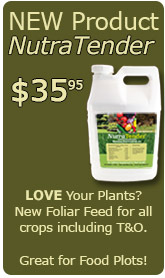 Kills most broadleaf weed, see label for specific weeds controlled. BUTYRAC 200 IS NOT SAFE ON CHICKORY, RADISHES, SUGAR BEATS OR TURNIPS!! Note: For grass control use Clethodim 2E, listed in our Food Plot Herbicide section. Approximate use rate: 1-2 quarts per acre. Spot spray applications approximately 2.5-3 ounces per gallon of water. We do not recommend tank mixing this product with other products! Use Butyrac in water only. No Surfactant or Crop Oil needed. Plants controlled or suppressed by Butyrac 200 Herbicide, see label for specific information. Butyrac 200 Herbicide is labeled for use on the following crops but always consult the label for specific crop information.